If you look up the word котлета in some Russian-English dictionaries, you will find the word cutlet as a translation. If you do, take your black pen and cross that line of the dictionary out. In modern American English a cutlet is a piece of meat, but it is NEVER ground meat.¹ In Russian котлета means a patty of ground meat. — На каком масле лучше жарить котлеты? Мама всегда добавляет чеснок, лук, соль и перец в фарш для котлет. Mom always addes garlic, onion, salt and pepper to ground meat patties. — Нет, я мясо не ем. — Я сделал американский сэндвич из говяжей котлеты и двух тостов. ¹ If you look at certain dictionaries, e.g. the current definition of cutlet at dictionary.com (mirror) includes something like “a flat croquette.” That is not a current meaning of the word in the US. ² Although “fish patties” is a perfectly grammatical phrase in English, I don't think I've ever had a fish patty in the US in my entire life. The phrase sounds bizarre to the average American ear. Although you usually encounter the word in the plural, it is also possible to find it in the singular. There is also a non-diminutive form фрикадель, although I haven't heard it in common speech. My favorite фрикадельки at the moment are the курино-говяжьи фрикадельки 'chicken and beef meatballs' served at the Трали-Вали dining room at ТГГПУ. Oddly enough, I don't get any hits on that phrase at all on Google, so perhaps they are a newer type of фрикадельки. Я вчера сделала двести фрикаделек из говяжьего фарша. Yesterday I made two hundred ground beef meatballs. — Какой у нас суп сегодня? — Правда? Дайте две порции. Я рассольник обожаю. "What soup do we have today?" "Really? Two servings, please. I adore pickle soup." На гарнир к фрикаделькам можно подать картофель, рассыпчатый рис, кашу, макаронные изделия, отварные овощи, салат из сырых овощей. (adapted from this source) As a side dish for meatballs you can serve potatoes, rice, boiled grain dishes, pasta, boiled vegetables, or a raw vegetable salad. Мексиканские повары приготовили самую большую фрикадельку в мире весом почти 50 килограммов. (adapted from this source) Mexican chefs have made the world's largest meatball, weighing nearly 50 kilos. Some years ago I read a book entitled “Scandinavian Humor and Other Myths,” which had the following insight: every ethnic group has some food to which it is irrationally attached. 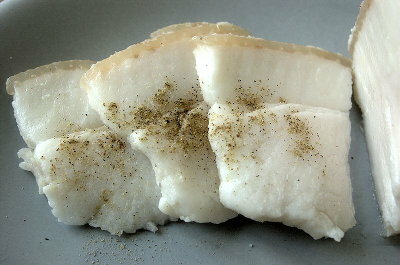 In the case of Scandinavians it is lutefisk. The Scots revel in abominable haggis, and the Mexicans in menudo. Doesn't that look yummy? A marvelous article on сало can be found at appetissimo.ru, which lets us know that сало won't make us fat or clog our arteries and really should be consumed with hooch. And if you read Ukrainian, don't miss out on the Salo Lovers Club. Я люблю пожарить кусочки сала и есть их на хлебе с маслом. I love to fry up pieces of fatback and eat them on bread with butter. — Ты слышал, что одесский завод производит сало в шоколаде? — Ой, как я пьян! The other day an anonymous querent wondered about the correct way to say “Thanks for the salmon!” The answer is: that depends. Спасибо за лосося. Thanks for the [whole] salmon. Спасибо за лососину. Thanks for the salmon [flesh]. Actually лосось can also mean simply the flesh of the animal, but every once in a while you will meet some pedant who will want you to distinguish the two words. In the US one associates salmon particularly with the the states of Alaska, Washington, and Oregon. 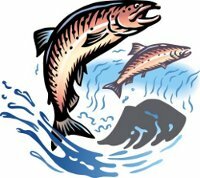 In Russia Камчатка is the major нерестилище of salmon. A нерестилище “spawning ground” is a place where fish lay their eggs.